Thank you for applying to Midland College! If you have not created a user profile with the Apply Texas site, you will need to do so before applying to Midland College. Determine your entry status and residency and submit application and transcripts. Midland College maintains an admissions policy which ensures that all persons who can profit from post-secondary education have an opportunity to enroll. Students begin the admission process by completing an application, available online at www.applytexas.org. Applicants may assume admission acceptance after all requirements are met. All inquiries should be addressed to the Office of Admissions, admissions@midland.edu. Please remember that being admitted to Midland College does NOT guarantee admission to certain specific programs of study. Specialized programs usually have additional qualification requirements. Applicants should consult with the division dean or a counselor/advisor for details concerning admission to these programs. Texas State Law SB 1107 mandates that all entering students under the age of 30 provide a certificate signed by a health care provider or an official immunization record verifying that the student has been vaccinated against bacterial meningitis, or has received a booster during the five years prior to registration and at least 10 days before the first day of the semester. Entering students include those entering college for the first time, transfer students from other colleges and returning or continuing students who have had a break in enrollment of at least one fall or spring semester. •	Students 30 years of age or older. •	Students who are enrolled only in online or other distance learning courses. •	Students who submit an affidavit or a certificate signed by a physician who is duly registered and licensed to practice medicine in the United States, in which it is stated that in the physician’s opinion, the vaccination required would be injurious to the health and well-being of the student. •	Students who submit an affidavit signed by the student stating that the student declines the vaccination for bacterial meningitis for reasons of conscience, including religious belief. •	Students living on campus must use the conscientious exemption form from the Texas Department of State Health Services. Allow several weeks to submit and have form approved by the Texas Department of State Health Services. Students are advised to check with their health insurance company regarding reimbursement policies for the vaccine.The bacterial meningitis vaccine is available at pharmacies. The local public health department has vaccines for uninsured and underinsured individuals. Students who fail to submit certified proof of vaccination or a valid booster within the required timeframe, will be unable to register for their intended term. Please note, vaccinations older than 5 years will require a booster and all bacterial meningitis vaccinations and booster must be administered by a health practitioner authorized by law to administer an immunization. Midland College students enrolled in certain health-related occupations and for those who live in on-campus housing may be required to show proof of other immunizations against communicable diseases. Students should contact the division dean of the appropriate program or the Student Life Director (432) 685-4781. Information about the risks of communicable diseases is published elsewhere in this catalog. Midland College reserves the right to require academic documentation for any applicant. A student’s eligibility for re-enrollment at his/her previous institution may be a consideration for admission at Midland College. Graduates from accredited Texas high schools or equivalent institutions are eligible for admission. Proof of high school graduation is required and must be documented. Proof of graduation may include an official high school transcript. Midland College will consider high school students between the ages of 16 to 18 on the basis of individual merit with school district and parental permission. Midland College, in partnership with Midland Independent School District, offers an early college high school. 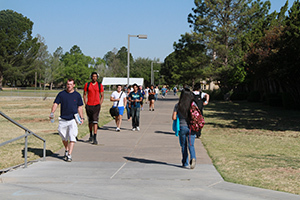 The high school starts with the 9th grade and is housed on the Midland College campus. Students begin taking dual credit courses in the second semester of their freshman year. Students must be eligible for dual credit and are selected through a process determined by the Midland Independent School District. Students may be admitted upon satisfactory completion of the GED® test. Upon satisfactory completion of the GED® test, a Texas Certificate of High School Equivalency, with the official GED® test scores, will be issued by the state and mailed from Austin. Once received, this document is required for admission. comply with all Texas Success Initiative testing requirements and Midland College placement testing requirements. provide an official transcript which must meet all Texas Education Agency (TEA) standards. Students will be required to have a Midland College counselor/advisor approve their schedule each time they enroll or change their schedule. Individuals who are 18 years of age or older and do not have a high school diploma or who have not passed the GED® test may be admitted without examination at the discretion of Student Services administrators at Midland College. Transcripts from previous high schools attended, together with tests and other devices, may be used in lieu of high school graduation. Students admitted on individual approval without a high school diploma or who have not passed the GED® test are not eligible to receive Title IV federal financial assistance. a transcript from the last school or college attended (The student must be the equivalent of a United States high school graduate and the transcript must be translated into English and must show each course and the grade earned.) Note: Evaluation by a credentials evaluation agency may be required. proof of insurance policy covering repatriation and medical evacuation. Policies available through Midland College. It is highly suggested that students coming from non- English speaking countries be required to take an ESL course their first semester at Midland College. International students must abide by Midland College rules as well as additional federal and state guidelines. Prospective international students must file completed applications with all required forms and a $20 non-refundable application fee. Send the fee, in the form of a check or money order payable to Midland College, to the Director of Counseling. An I-20 form will be issued to the student when the above qualifications have been met. International students must enroll and complete at least 12 semester hours of course work each semester. For further admission information go online www.midland.edu/admissions/international. Persons who are denied admission to the College may appeal to the Student Admissions Committee. Contact the Vice President of Student Services for information on the appeal process. A student may contract with an instructor to enroll in a credit course as an audit (non-credit) student. An audit student will not receive a final grade or credit for the audited course. The student is required to pay full tuition and additional fees. Audit status is determined at the time of registration and no later than the census date of the semester of enrollment. Residents of Texas who seek admission to a state college or university have the option of electing to have course work taken ten or more years prior to enrollment count as usual or to be ignored for admission purposes. Students electing to have course work ignored may not receive credit for any courses taken ten or more years prior to enrollment. Those hours ignored can be used as a basis for exemption from the Texas Success Initiative. A Texas resident who has taken more semester credit hours than the minimum required for a bachelor’s degree may be required to pay non-resident tuition rates for the excess hours. Attempted hours include all hours earned at public community colleges and universities, but do not include developmental or technical education hours. Students enrolled before the Fall 2006 have a limit of 45 semester credit hours above the minimum required for the Bachelor’s degree. Students enrolled beginning in Fall 2006 have a limit of 30 semester credit hours above the minimum required for a Bachelor’s degree. Additional information provided in the Texas Education Code 61.0595. Midland College accepts college-level transfer courses with a grade of “D” or better earned from accredited colleges and universities. Please note: some degree plans require a minimum grade of “C” to meet degree requirements. See degree plans in catalog for details. Transfer coursework is evaluated by the end of the semester in which the transcript is received for all students other than those who are transient or non degree seeking. Transfer credit is granted only for work (a) completed at a regionally accredited institution, (b) evaluated by a recognized foreign transcript evaluator, or (c) completed at an approved institution. Transfer courses from Texas institutions with a Common Course Number and drawn from the Academic Course Guide are accepted. Courses found in the Workforce Education Course Manual may also be accepted. Courses not included in 3) above are evaluated based on content and semester credit hours with consultation with and approval of instructional administration as needed. Transfer students are required to provide official copies of all transcripts from every college or university previously attended. As transcripts from accredited colleges and universities are received, they are evaluated in the Registrar’s Office. A copy of that evaluation is sent to the student at the address recorded in the student files. Continued enrollment is contingent on receipt of all transcripts. Please send transcript electronically, institution to institution via SPEEDE if service is available. Baccalaureate graduates from an accredited college or university may receive an Associate in Applied Science degree from Midland College upon successful completion of 30 semester hours of courses within a technical specialty area, any prerequisite leveling courses as determined by the appropriate dean and general education requirements. Students interested in the program should consult with a counselor in Student Services. Students planning to transfer to another college after attending Midland College should contact a counselor/advisor. Students should select a major field of study and a college or university which offers a bachelor’s degree in that field. A Midland College counselor or advisor will help students select Midland College courses corresponding to those they would take at the college or university. Students should check with the senior college or university regarding admission requirements and transfer regulations and should arrange for the Midland College Registrar to send an official transcript. Following are procedures for the resolution of disputes involving the transfer of courses from Midland College to other public institutions in Texas. If an institution of higher education does not accept course credit earned by a student at another institution of higher education, the receiving institution shall give written notice to the student and to the sending institution that transfer of the course credit is denied. A receiving institution shall also provide written notice of the reasons for denying credit for a particular course or set of courses at the request of the sending institution. A student who receives notice as specified may dispute the denial of credit by contacting a designated official at either the sending or receiving institution. The two institutions and the student shall attempt to resolve the transfer of the course credit in accordance with Texas Higher Education Coordinating Board rules and guidelines. If the transfer dispute is not resolved to the satisfaction of the student or the sending institution within 45 days after the date the student received written notice of denial, the institution that denies the course credit for transfer shall notify the Commissioner of Higher Education of its denial and the reasons for the denial. The Commissioner of Higher Education or the Commissioner’s designee shall make the final determination about a dispute concerning the transfer of course credit and give written notice of the determination to the involved student and institutions. The Higher Education Coordinating Board shall collect data on the types of transfer disputes that are reported and the disposition of each case that is considered by the Commissioner’s designee. If a receiving institution has cause to believe that a course being presented by a student for transfer from another school is not of an acceptable level of quality, it should first contact the sending institution and attempt to resolve the problem. In the event that the two institutions are unable to come to a satisfactory resolution, the receiving institution may notify the Commissioner of Higher Education, who may investigate the course. If its quality is found to be unacceptable, the Higher Education Coordinating Board may discontinue funding for the course. Midland College partners with area universities to provide special transfer opportunities just for Midland College students. These transfer agreements are designed to provide Midland College students a seamless transfer to those institutions. Depending on the institution, students can expect a variety of benefits including: special admissions coordination to the universities, early degree planning, access to upperlevel advising, and access to the institutions’ online student website, to name just a few. The programs also provide for the retroactive awarding of an associate degree from Midland College. This process allows hours completed at the upper-level institution to be transferred back to Midland College to complete an associate degree program. Each university may have varying additional admission requirements. Your advisor at Midland College can help you identify those requirements. Visit with a counselor to identify interests, testing needs and degree plan. Monday-Thursday, Counselor/Advisor available until 6:00 p.m.
Extended evening hours are available on Tuesdays. Monday-Thursday 7:00 a.m. - 5 p.m.
Counselor/Advisor available until 6:00 p.m.
Midland College provides a professional staff to help students with academic, personal and career counseling, financial aid, and international student advising. A student who has a TSI deficiency will be advised by a counselor/advisor, in consultation with the appropriate developmental faculty, prior to enrollment. Academic advisement is provided regarding appropriate major and course selection, study habits, developmental work and transferring to other colleges or universities. Faculty advisors cooperate with the counseling staff in aiding the individual student with academic issues of course selection and career choice. Degree plans should be arranged with the faculty advisor as early as possible and may be modified at any time. Prior to the semester of graduation, students must have the degree plan approved by the appropriate division office. Personal/Social adjustment counseling is provided on a confidential basis regarding issues of life adjustments which many college students experience. Veterans Services – Students eligible for federal VA education benefits should contact the coordinator in the Midland College Financial Aid office. Hazlewood Act benefits are processed through the Financial Aid office. Some veterans may also qualify for certain residency exemptions. More information on these benefits and links to additional veteran information are available on our website at www.midland.edu/va. Referrals are provided regarding financial aid, tutoring, job placement, medical emergencies, or personal adjustment problems. The Career Center provides services for students that include tutoring, career guidance and support for mature returning students and single parents to enable them to succeed at Midland College. Career interest tests are available and include the Myers-Briggs personality indicator, Self-Directed Search, 16 Career Cluster Survey and Texas C.A.R.E.S.. The Job Placement Office provides Midland College students and recent certificate, associate and baccalaureate graduates with opportunities for full and part-time employment. The office is designed to prepare, screen, and refer qualified applicants to job openings. Resume assistance, seminars on interviewing skills, job search techniques, and an annual community-wide job fair are other services provided to the students. For more information, contact the Job Placement Coordinator, (432) 685-4716. The college work-study program provides employment for students who have demonstrated financial need. The maximum amount a recipient can earn under this federal program is determined by the financial aid application. Students employed under this program are paid at least the minimum wage and may work a maximum of 15 hours per week. A current list of college work-study jobs is available in the Job Placement Office in the Scharbauer Student Center. Student Support Services is a federal TRiO program funded by a grant from the Department of Education in the amount of $247,584. Designed to serve 160 participants, the goal of SSS is to keep students in college and increase graduation rates while assisting with the transition to the university of choice. In addition to providing one-on-one advising and registration, participants can get help with financial literacy, including how to find scholarships. SSS also has tutors and mentors that help encourage success at Midland College through test preparation, study skills, and overall academic development. To be selected into SSS, full-time students must first apply and be accepted to Midland College. U.S. citizens or legal residents who are receiving Pell grants are strongly encouraged to apply to the program. Citizens and resident students who are first generation college (neither parent has a four-year degree) or students who are disabled are also eligible to apply. Student Support Services is located in the Scharbauer Student Center, rooms 129-131. Services for Midland College students with disabilities are provided through Student Services. Medical documentation must be on file with the Counselor/Disability Specialist to qualify for services. Services include, but are not limited to: assistance with the registration process, technical assistance with modification of course requirements, and referral to other appropriate campus and community resources. Academic, career, and personal counseling are available upon request. The student’s permanent records are confidential. Individuals may examine personal records at any time. Personnel within the institution may examine their student records when it is in the best interest of the student. As per Public Law 93-380, The Family Education Rights and Privacy Act of 1974. Students with disabilities should notify Midland College in advance regarding their need for services to allow arrangements to be in place at the beginning of each semester. Students who require sign language interpreters or materials from Recording for the Blind & Dyslexic should contact the specialist as soon as possible because these accommodations may require additional time to implement. Midland College assistance may include but is not limited to note takers, scribes, transcriptions of tape recordings, tape recorders, alternative testing options, preferential seating or other appropriate accommodations. The Americans With Disabilities Act (ADA) and Section 504 of the Rehabilitation Act require that no otherwise qualified person with a disability be denied access to, or the benefits of, or be subjected to discrimination by any program or activity provided by an institution or entity receiving federal financial assistance. It is this Section 504 mandate that has promoted the development of disability support service programs in colleges and universities across the country. Subpart E of Section 504 deals specifically with this mandate for institutions of higher education. While it does not require that special educational programming be developed for students with disabilities, it does require that an institution (public or private) be prepared to make appropriate academic adjustments and reasonable accommodations in order to allow the full participation of students with disabilities in the same programs and activities available to nondisabled students. A complete handbook for students with disabilities is available in the Scharbauer Student Center. Information, forms, and resources are available on the MC website at www.midland.edu. Click on Admissions/Student Services, then Student Services, then Students with Disabilities. Call (432) 685-5598 for more information. Midland College will grant a maximum of 24 semester credit hours (SCH) to any new student having an International Baccalaureate Diploma based on the table below. Midland College may grant fewer than 24 SCH to a student if the student has scored less than 4 on any IBD examination administered as part of the diploma program. Applicants with the IB diploma must provide a completed IB transcript to the Admissions Office before enrolling in order to receive credit. Students who participate in the International Baccalaureate Program may receive college credit for exam scores of 4 or better on most Higher Level (HL) Exams and for a 5 or better on most Standard Level (SL) Exams. The amount of credit awarded will depend upon the exam scores and the level of the courses. The Testing Center, located in the Scharbauer Student Center offers a wide array of testing services for students. In addition to standardized testing, the Center provides make-up testing for Midland College faculty, proctors exams for distance learning and Virtual College of Texas (VCT) courses, as well as administering a number of professional certification tests. 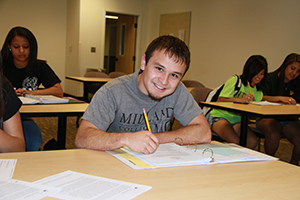 Midland College administers an extensive testing program for interested students and residents of the community. The Testing Center provides the facility for staff to administer CLEP, COMPASS, ICE, TEAS and THEA exams. Midland College administers College Level Examination Program (CLEP) examinations. Upon approval of the Division Dean and departmental faculty, departmental examinations may be used in cases where approved CLEP tests are not available. Procedures also exist for the granting of credit through the Advanced Placement by examination. Credit will not be granted until student has earned an equal or greater number or semester credit hours at Midland College. Please inquire in the Testing Center for additional information. Midland College may grant credit toward a degree or certificate if a student has achieved knowledge and skills from non-traditional sources. This knowledge must be demonstrated by: 1) written examination conducted by nationally recognized services or by a Midland College instructional department; 2) professional certification; or 3) military training/education. The maximum credit that will be awarded for non-traditional learning is 75% of the semester credit hours needed for the degree sought. Students should contact the Registrar’s Office for detailed information. Midland College offers the GED® test for those who have not completed a formal high school education. The successful completion of the GED® test secures a certificate of high school equivalency and enables students to enter college and pursue a college degree. The GED® test is administered in Room 182 of the Technical Center Annex. In order to receive a Texas Certificate of High School Equivalency, a student must pass all tests with a combined score of 2250 (450 Average) and with no one test scoring below 410. Advance registration is required. Please contact the GED® Examiner at (432) 685-6886 for detailed information on fees and scheduling a test. Information can also be found on the Adult and Developmental Education page on the Midland College website. In the State of Texas, students may have either HIST 1301 or HIST 1302 credit by examination on their transcripts. Students may not have credit by examination for both courses. Likewise, students may be awarded credit by examination for one Government course only. Advanced Placement scores of 3 or better are accepted for designated subject areas. If you have scores in an area not listed below, please see the Testing Coordinator. Texas public institutions of higher education will be required to assess all first-time college students under the Texas Success Initiative (TEC ʂ51.3062) using the new Texas Success Initiative (TSI) Assessment no later than the first day of classes in fall 2013. The new assessment is being developed. All other tests (ACCUPLACER , COMPASS, THEA and ASSET) will no longer be used to determine college readiness. Please visit the Midland College TSI page for more information. PREP 0170 is required for all students who are developmental in two or more areas. PREP 0170 must be completed with a “C” or greater in order to be TSI complete. Students must enroll in PREP 0170 their first semester. Students who are exempt from the Texas Success Initiative and wish to enroll in a math class above college-entry level math, must take a math placement test. Please contact the Midland College Testing Center for more information, (432) 685-4504. High school students wishing to enroll in dual-credit courses must meet appropriate TSI requirements. *PSAT/NMSQT – a combined math and critical reading score of 107 with a minimum of 50 on each section relevant to the courses to be attempted. *PLAN – a composite score of 23 with a minimum of 19 on the math and/or English section. *An eligible student who has enrolled in dual-credit under either of these tests MUST demonstrate eligibility again to enroll in 12th-grade dual-credit courses. If not covered by any of the above tests, then a student must pass the portion of the TSI test that correlates with the dual-credit class being requested. Students with disabilities should notify Midland College in advance regarding their need for services to allow arrangements to be in place at the beginning of each semester. Students who require sign language interpreters or materials from Recording for the Blind & Dyslexic should contact the specialist as soon as possible because these accommodations may require additional time to implement. Midland College can provide assistance in the form of note takers, scribes, transcriptions of tape recordings, tape recorders, alternative testing options, preferential seating or other appropriate accommodations. ACT tests with a composite score of 23 with a minimum of 19 on the English test and/or the mathematics test shall be exempt for those corresponding sections. SAT tests with a combined verbal and mathematics score of 1070 with a minimum of 500 on the verbal test and/or the mathematics test shall be exempt for those corresponding sections. For a period of three (3) years from the date of testing, a student who tests and performs on the Eleventh grade exit-level Texas Assessment of Knowledge and Skills (TAKS) with a minimum scale score of 2200 on the math section and/or a minimum score of 2200 on the English Language Arts section with a writing subsection score of at least 3 shall be exempt from the assessment required under this title for those corresponding sections. A student who has graduated with an associate or baccalaureate degree from an institution of higher education. A student who transfers to Midland College from other accredited institutions of higher education with appropriate college-level work in the areas of writing, reading and/or mathematics (grades of “C” or higher) may be deemed as college-ready after review by the Registrar’s Office. Students not meeting college-readiness in writing, reading or mathematics will be required to take the THEA or COMPASS test for that area. A student who has previously attended any institution and has been determined to have met readiness standards by that institution. A student who is serving on active duty as a member of the armed forces of the United States, the Texas National Guard, or as a member of a reserve component of the armed forces of the United States and has been serving for at least three years preceding enrollment. Written documentation from the appropriate branch of the military is required for the exemption to be granted. A student who on or after August 1, 1990 was honorably discharged, retired, or released from active duty as a member of the armed forces of the United States or the Texas National Guard or service as a member of a reserve component of the armed forces of the United States. Written documentation (DD-214) is required before the exemption will be granted. A casual/enrichment student who is taking courses for personal interest only and who is not seeking a degree or certificate will be allowed to defer developmental course work and may enroll under the following conditions: (a) take a maximum of two courses per semester that are not academically restricted courses; (b) may not declare a major; and (c) may not receive financial aid. Consult with a Midland College counselor/ advisor for a list of academically restricted courses. See course descriptions for prerequisite. MATH 0371 , MATH 0372 , MATH 0171-0173 , MATH 0174, 0175, 0176 , and MATH 0177, 0178, 0179 have corequisite lab MATH 0170 . Students must register for the math class and the required lab. *MATH 0471 does not have a corequistie lab. Students must enroll in EDUC 1200 /PSYC 1200 . Note: MATH 1324 and MATH 1342 require students to make a “B” or greater in MATH 0372 and a “P” in MATH 0177, 0178, 0179 and corequisite lab, MATH 0170 . At any time in the develomental sequence, students may retake the THEA or COMPASS to see if TSI requirements can e satisfied. It is recommended that stuents stay in class and complete coursework to receive credit and knowledge for further academic success. If a student scores with the corresponding requirements above, by taking the TSI Assessment before the course ends, the student will reeive a “B” in MATH 0370 and a “C” in MATH 0371 and MATH 0372 . Specified placement score or ‘C” or greater in IRWD 0371 or IRWD 0372 or a passing score on the Midland College Writing Assessment Exam (MCWAE) and TSI met in Reading. ENGL 1301 220 59+ on the objective, essay score of 5 or a 6, and a Reading score of 81+ Specified placement score or a passing score on the Midland College Writing Assessment Exam (MCWAE) and TSI met in Reading. At any time in the developmental sequence, a student may retake the THEA or COMPASS to see if the student can satisfy TSI requirements. It is recommended that a student stay in class and complete coursework to receive credit and knowledge for further academic success. If a student passes the TSI requirements by taking the TSI assessment before the course ends, the student will receive a “C” in the course. Stuents complete TSI requirements with a “C” or better in IRWD 0371 or IRWD 0372 and a passing score on the Midland College Writing Assessment Exam (MCWAE). Specified placement score OR “C” or greater in IRWD 0370 . Students exit with a paassing score on the Midland College Reading Assessment Exam (MCRAE) plus a “C” or greater in the course, or by state-approved test. Note: If a student fails to pass the MCRAE or the MCWAE, additional assessment may be necessary for proper sequential placement. A student not exempt from THEA or developmental education must follow this plan of action. A student must begin developmental education upon enrollment after taking THEA or another state-approved assessment that identifies areas of deficiency. Students must enroll in developmental classes for each TSI deficiency and continue until sequence is completed. A student must continue in developmental education until all TSI requirements are met except for winter interim, spring interim and summer sessions. Successful completion, as defined by intitutional requirements of each developmental course, allows the student to move to the next course. Midland College requires that students who fail two or more areas of the TSI assessment tests will be enrolled into a Student Success Course during their first semester attending Midland College and pass with a “C” or better. Students must enroll into PREP 0170 . Register ONLINE through Campus Connect or during walk-in registration at the Scharbauer Student Center. There are two methods of registration at Midland College. Students who are in good academic standing, have all required paperwork submitted to the Admissions Office, and have no financial or academic holds on their record are eligible to register online. Students are encouraged to meet with a counselor/advisor if he/she is in need of assistance in planning a course schedule. All students may register in person in Student Services. Consult the course schedule for more details. Please refer to the course schedule for registration deadlines. Some courses have special prerequisites; check individual course listings. Some programs have limited enrollments. It is the responsibility of each student attending Midland College to register under the proper residence classification and pay the correct tuition and fees. The Texas Higher Education Coordinating Board rule 21.731 requires each student applying to enroll at an institution to respond to a set of core residency questions for the purpose of determining the student’s eligibility for classification as a resident. This questionnaire, along with other pertinent residency information, is available in the Admissions Office and on the Midland College website at www.midland.edu/admissions. To qualify for In-District tuition, a student must be classified as a Texas resident and have been a resident of the Midland College District for a period of six months before the first enrollment. A Texas resident who does not physically reside within the geographic boundaries of the Midland College District will pay Out-of-District tuition. Aliens living in the United States under a visa must meet the same tuition residency requirements as do U.S. citizens. A permanent resident must meet the same length of residency requirements as a citizen. A student may reclassify from Out-of-District to In-District status, with appropriate documentation, after six months residency in the Midland College District. A listing of those documents which can be accepted for the purpose of residency classification is available in the Admissions Office and on the Midland College website. The Midland College Board has adopted Section 130.0032, Subchapter A, of the Texas Education Code that permits a person who resides outside of the Midland College District and who owns property subject to ad valorem taxation by the Midland College District, or a dependent of the person, to pay tuition at the rate applicable to a student who resides in the district. To qualify for this benefit, the property owner or dependent must provide the Admissions Office with a copy of a Notice of Appraised Value Statement from the Midland Central Appraisal District in the property owner or dependent’s name that shows Midland College as one of the taxing units. Payment is due at the time of registration. Pay your tuition bill using financial aid earned or take advantage of one of several payment methods. Students who enroll both in a community college and a senior college or university should register for the community college courses first. After that has been completed, they should take their receipt to the senior college or university and register. This may result in savings of tuition and fees. Midland College offers senior citizens an exemption from the payment of general use fees when they enroll in credit classes. To be eligible for the exemption, students must be sixty-five years of age or older and pay tuition costs plus any lab fees. All other Midland College policies apply. The schedule below reflects the combined tuition and general use fees required of all courses. Certain courses may require additional fees for labs, liability insurance, private instruction, and testing. This schedule reflects the tuition and fee rates in effect at the time of printing. All tuition and fees printed in this catalog are subject to change by the Midland College Board of Trustees. The most recent rates are published in the course schedule. Note: Additional fees may be charged for lab, course, insurance and private instruction. Courses with lab components are designated by the second number in parentheses following the title and semester credit hours in the course description area of this catalog. For example COSC 1330 - Computer Programming 3 Hours (3-1) has a lecture component of 3 hours and a lab component of 1 hour. *Student liability insurance is required for students enrolled in Alcohol and Drug Abuse Counseling Practicum I (DAAC2166) and Practicum II (DAAC2167); Associate Degree Nursing clinical courses; Child Care and Development courses; Cosmetology courses; Diagnostic Medical Sonography clinical courses; Emergency Medical Services clinical courses; Respiratory Care clinical courses; and Vocational Nursing clinical courses. This is subject to change due to insurance rate changes. Students may also be charged for loss or damages to college property for which they are responsible. Non-payment of these obligations may result in the withholding of grades, transcripts, or graduation. Students may pay tuition and fees and/or room and board on an installment basis. These require two separate payment plans. A $25.00 processing fee is charged for each plan. The student can execute an installment agreement on the Midland College website www.midland.edu within their Campus Connect account. There are different payment plan options depending on the time that you register. Tuition and fees or payment plan contracts are due at the time of registration. Failure to pay the complete balance may result in denial of course credit for that semester. Please be aware that refunds are made according to the date that classes officially begin rather than the date the student enrolls. All tuition and fee refunds must be initiated by the student. The date on the drop slip will determine the date of withdrawal and the amount of refund. Late fees and payment contract fees are nonrefundable. Refunds will be processed after the state census of the semester. Refunds take approximately 2 to 3 weeks to process. In accordance with the Higher Education Amendments, Section 484B, students receiving any Title IV funds (Pell, Supplemental Educational Opportunity Grant, Federal Direct Loan Program or Direct Parent [PLUS] Loans), who completely withdraw from school prior to the 60 percent point in the semester may owe a repayment of grant funds received. Part of the repayment may be owed directly to the Department of Education and the remainder to the school. Midland College is required by the Department of Education to evaluate each student who receives Title IV funds to determine if the student has earned all of the money received and calculate if the student owes. Students owing will be notified in writing. The student must then respond by repaying the funds owed or establishing a repayment agreement. Students not responding will no longer be able to receive any Title IV funds at any school until repayment is made. For additional information, contact the Financial Aid Office at (432) 685-5513. Tuition and fees paid directly to the institution by a sponsor, donor, or scholarship shall be refunded to the source rather than directly to the student. Financial aid at Midland College is intended to help students and their families pay for the costs associated with obtaining a college education. With financial assistance from state or federal governments, civic groups and colleges, more students have found they can afford higher education. All students receiving federal financial aid at Midland College must have a high school diploma or a GED® certificate. In addition, a student cannot receive financial aid from more than one school during the same semester. Eligibility for various scholarships may be based upon a combination of academic achievement, financial need, and the wishes of the donor. The U.S. Department of Education frequently changes regulations pertaining to financial aid and disbursement. Due to these changes, the Midland College Financial Aid Office reserves the right to make policy and procedure changes during and between award years. If you have any questions concerning the above information or financial aid, please consult with a financial aid representative. No person shall be excluded from participation in, denied the benefits of, or be subject to discrimination under, any program or activity sponsored or conducted by Midland College, on any basis prohibited by applicable law, including, but not limited to race, color, age, marital status, national origin, religion, gender, disability, or status as a qualified disabled veteran or veteran of the Vietnam era. Students transferring from another institution, between the fall and spring semesters, must notify the Financial Aid Office and submit all needed documents from all institutions that were attended beyond high school, whether or not financial aid was received at the institution. Once all the required documentation has been received, transfer students are placed on a transfer monitoring list for seven days before a financial aid award can be made. By applying for aid at Midland College, the student gives permission to the Financial Aid Office to verify any and all information. All documents provided will become the property of Midland College and may not be returned to the student. Transient students—students who are enrolled in another college or university who attend Midland College for one semester, are not eligible for grants, loans, or work-study. Adding courses after the census date will not change aid eligibility for the semester. Students must be enrolled in at least 6 hours to receive some types of financial aid. Full-time enrollment is 12 or more semester credit hours, 3/4 time is 9 to 11 hours, ½ time is 6 to 8 hours and less than ½ time is 1 to 5 hours. If paid for any prior semester, students will only receive funds for classes in which a grade of “C” or better was achieved. By accepting financial aid at Midland College, students agree to receive their funds according to the Midland College financial aid disbursement policy and to keep all receipts for charges and residuals received from the Financial Aid Office. The Financial Aid Office may not have and/or provide copies of receipts that may be needed by students for tax or other purposes. Students are allowed to charge tuition, fees, books, room and board against any grant or scholarship received (as applicable). The official enrollment date is the census date (12th class day) for each semester. All financial aid awards are locked on the census date, and aid amounts are based on that enrollment status. No book vouchers of any kind will be issued after certain dates. All residual balances from Title IV aid (Pell, SEOG, Direct Loans) will be issued during the semester. Residual balances will be applied to the student’s Chap Card or deposited directly to the student’s designated bank account. A disbursement schedule which states all the book voucher and dates for the academic year will be mailed with the students award letter. No other notice of these dates will be mailed to the student. Students with an extenuating circumstance can appeal the disbursement policy before the census date. All sources of aid are applied toward tuition, fees, books, and room and board before any residual is paid. Note: New regulations require that students withdrawing completely before the 60% point in the semester repay any unearned portion of Title IV aid that they received. Students may owe a portion of the unearned aid received to the school if it was used to pay for tuition, fees, books, room and board, or to the Department of Education, if it was disbursed to the students. Students owing a repayment will not be able to receive any additional federal funding without a repayment agreement and timely payment. Complete the application for federal aid-preferably online at www.fafsa.ed.gov-each year after filling out federal income tax forms. Also, complete the Midland College application process. Apply for all types of aid funded by Midland College by completing the Free Application for Federal Student Aid (FAFSA) and General Scholarship application by the deadlines. Submit all required documents to the Financial Aid Office. Check on the status of the application periodically. Federal grants and work-study positions are awarded on a first-come, first-serve basis. In accordance with federal regulations, preference is given to applications which are submitted prior to the deadlines indicated. The financial aid process is lengthy. If the priority deadlines are missed, funds may not be available in time for registration. In order to receive maximum consideration for financial aid, a student’s file must be complete by the above dates. A file is complete when all necessary documents have been provided to the Financial Aid Office. This usually means that a student has completed the Free Application for Federal Student Aid (FAFSA) and listed Midland College on that application. Additional documents or information may be needed to complete a file if a student is selected for verification. Additional documents may include, but are not limited to; a signed copy of the student’s and/or parents tax return transcript provided by the IRS of the previous year, a verification work sheet, an Economic Sufficiency Form, or verification of untaxed income. If a student is selected for verification, the student’s file is not complete until all information is determined to be accurate and results of any corrections have been received by the Financial Aid Office from the Department of Education. It is the student’s responsibility to provide all documents needed by the Financial Aid Office. Complete files will be processed in date order. The student will be sent an award letter that lists all aid that the student is eligible to receive at Midland College for the school year. Midland College participates in the Federal Direct Loan Program. We offer Stafford Loans and Plus (Parent) Loans. Complete both an entrance and exit counseling session. Students have the right to appeal any of the above loan criteria. You are encouraged to apply for the loan by census date (12th class day). Yearly subsidized loan limits: Freshman $3,500, Sophomore $4,500, Junior and Senior $5,500. Students interested in loans should contact the Midland College Loan Coordinator at (432) 685-4693. There are several organizations that offer alternative educational loans. These loans are not federally funded and the lending institution determines their criteria. Develop a student body committed to quality education in the liberal arts tradition. Consequently, Midland College offers academic and performance scholarships, as well as need-based scholarships, both endowed and undesignated, that recognize excellence. Scholarship awards may be based upon merit, interest, need or ability. Normally, scholarships are awarded for one year. In most cases, one-half of any yearly scholarship is awarded for the fall semester and the remaining half for the spring semester. However, a student must meet all academic requirements at the end of each semester. Most Midland college scholarships are considered “charge only”-a cash residual will not be given. Scholarships are gifts and do not have to be repaid. Unless specified in the scholarship agreement, no scholarship aid will be given for audited courses or for workshop participation. Applicants must be in the top 5 percent of their graduating class from high schools outside of Midland County. Applications are made through the high school or the Midland College Financial Aid Office after February 1. The award covers tuition, fees, and books to a maximum of $1,000 per semester. Applicants must have a high school GPA of 2.75 on a 4.0 scale, be a graduate of a Midland County high school, and complete 40 hours of community service at an approved agency. Applications are available in the high school counselor’s office and online. The scholarship covers tuition with a maximum of $1,050 for each long semester; summer and interim semesters are not included. Students must be enrolled in at least 6 semester hours. In order to renew the scholarship for a second year, the student must remain in good standing, reapply, and complete 40 more hours of community service. For early high school graduates, eligibility for the scholarship begins in the fall semester after graduation. Applicants must be Midland County Residents and must have successfully completed their GED® test within the last 12 months through the Midland College Testing Center. Applications are available at the Midland College Financial Aid Office. This scholarship covers tuition with a maximum of $1,050 for the fall and spring semesters only. Students must be enrolled in at least 6 semester hours. The scholarship is renewable for three additional semesters, provided that students remain in good standing and reapply for the scholarship for the sophomore year. Students must be Midland Legacy, Abell-Hanger GED® Completion Scholarship or Students in Philanthropy scholarship recipients in good standing at Midland College, must have 3.0 GPA or higher, must provide 25 hours of community service each semester and must be residents of the state of Texas and citizens of the United States. The amount of scholarship is $6,250 per semester and is renewable for 2 years or 4 semesters if qualifications are met. Students must be enrolled in at least 12 credit hours per semester and demonstrate financial need. Deadline for application is April 1st. To qualify, students must be graduating sophomores. Athletic scholarships are governed by conference rules and are awarded by coaches based upon athletic ability and academic criteria. Applications are available from the Midland College Athletic Department. The amount of scholarships will vary. Midland College general scholarships are funded by many sources. Scholarships are awarded on a first-come-first-served basis. Students must apply online at https://mama.midland.edu/cc3/aid.html. A minimum grade point average of 2.0 is required; however, some scholarships have higher standards. Exceptions may be made on an individual basis at the discretion of the Director of Financial Aid. Students in Philanthropy (SIP) is a scholarship-based, student leadership program funded by the Abell-Hanger Foundation and the Helen Greathouse Charitable Trust. Up to 25 SIP members participate in program activities which are designed to enhance the students’ knowledge of the nonprofit and philanthropic communities. Students must make a full academic year commitment to the program and are required to attend weekly meetings, conduct agency site visits, participate in various presentations and seminars as well as participating in community service opportunities throughout the year. The Ambassadors scholarship is funded by the Midland College Foundation. This scholarship pays $500 toward the cost of fall and spring on-campus housing. Ambassadors assist with on-campus events and complete leadership training. Students must prove their eligibility for all state exemptions. In addition, students will need to provide the proper documentation to the Financial Aid Office at the time of registration each semester, but no later than the census date of the semester for which the student wishes to use the exemption. More detailed information regarding state programs can be found at http://www.collegefortexans.com/apps/financialaid/tofa.cfm?Kind=E. Competitive scholarships pertain to certain students who, when receiving competitive scholarships, will pay out-of-district tuition rates who would normally pay nonresident tuition rates. A competitive scholarship is defined as a “scholarship totaling $1,000 or more for the academic year, which both resident and non-resident applicants will be in competition to receive.” Competitive scholarships may be awarded on the basis of either academic potential or performance, which is determined by the nature and scope of the scholarship for which the award will be made. The scholarship committee membership depends upon which department has responsibility for the selection of recipients of the particular scholarship. The factors to be used in the selection of recipients will depend upon the individual scholarship requirements. An academic year, for purposes of competitive scholarships, is defined to be the fall semester through the second summer session of each school year. Veterans who were Texas residents when they joined the military and are now residents may be eligible for exemption of tuition and fees. The Hazlewood Exemption covers no more than 150 cumulative semester hours. Applicants must provide a DD-214 along with verification of Montgomery GI Bill expiration (if the veteran served after 9/11) and must complete an application. A new application must be completed each semester. Students who have used the Hazlewood Exemption at a school other than Midland College must provide Hazlewood transcripts to verify the number of hours used at other institutions. Under certain conditions, unused hours of exemption eligibility may be transferred to a dependent child. In addition, students that have a parent or spouse who died as a result of service-related injuries or illness, is missing in action, or became totally disabled for purposes of employability as a result of service-related injury or illness may qualify for the exemption. Applications for the Hazlewood Exemption can be downloaded from the College for Texans website: http://www.collegefortexans.com/apps/financialaid/tofa2.cfm?ID=579. An eligible veteran may assign unused hours of exemption eligibility to a child. Certain conditions and restrictions do apply. This program provides an exemption from the payment of tuition (only) to a child, or stepchild, of a member of the Armed Forces who was deployed to Active duty in a combat zone outside the United States. Is enrolled for a semester or other academic term during which the service member of the armed forces is deployed on active duty for the engaging in a combative military operation outside the United States. To receive the exemption, students must be able to provide proof of meeting the program’s eligibility requirements, as outlined above. Child must provide proof (ex-military orders, pay records from service member’s unit to which he/she is assigned, etc.) of service member’s deployment from the Department of Defense for the relevant semester or academic term. If additional documentation is needed, students may wish to contact The National Personnel Records Center at (314)801-0800. The highest ranking graduate from any accredited Texas high school is eligible for exemption from tuition for the first two long semesters following graduation. Certification from the Texas Education Agency is required. Legally blind or deaf students may be exempt from paying tuition and all fees. Application must be made through the Department of Assistive and Rehabilitative Services (DARS). Senior citizens 65 or older may be exempt from paying course-related fees. To receive the exemption, students must present a valid picture ID and proof of birth date to the Midland College Financial Aid Office. Students employed as fire fighters are exempt from the payment of tuition and laboratory fees for courses offered as part of a fire science curriculum. To apply, students must contact the Midland Fire Science Department and submit documentation to the Midland College Financial Aid Office. Guidelines are pending one week prior to the end of regular registration. Students must apply for exemption. Certain members of the Texas Army or Air National Guard and Texas State Guard may be eligible to receive a tuition exemption. To apply, students should contact the Education Services Office at Camp Mabry: http//www/agd.state.tex.u.s./education/. Eligible persons employed as clinical preceptors and their children may be eligible to receive a tuition exemption (up to $500). 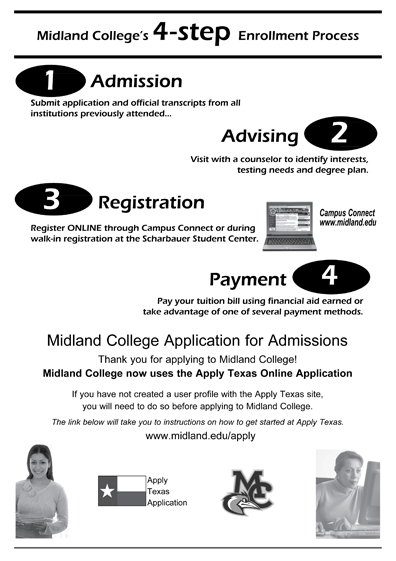 Application are available in the Midland College Financial Aid office. Eligibility is determined by completion of the Free Application for Federal Student Aid (FAFSA). The award amount (approximately $5,550 maximum) is determined by need and is set by the U.S. Department of Education each year. Eligibility is determined by completion of the Free Application for Federal Student Aid (FAFSA). The award amount is determined by need with a minimum of $100 per year and a maximum of $4,000 per year. Eligibility is determined by completion of the Free Application for Federal Student Aid (FAFSA). The award amount is determined by need. Among other criteria, eligibility is determined by completion of the Free Application for Federal Student Aid (FAFSA). To qualify, a student must be a Texas resident, graduate from a public or accredited private high school in Texas no earlier than fall 1998, apply no later than 16 months after high school graduation, complete the recommended or advanced high school curriculum or its equivalent, have financial need, enroll in at least 9 semester hours in an undergraduate degree or certificate program, have a family contribution of no more than $4,000, and not have been convicted of a felony or a crime involving a controlled substance. The maximum award amount at Midland College is $1,780 per year. Among other criteria, eligibility is determined by completion of the Free Application for Federal Student Aid (FAFSA). To qualify, a student must be a Texas resident, have financial need, if applying for his/her first award have a family contribution of no more than $2,000, be enrolled. In order to maintain eligibility for federal, state and some forms of institutional financial aid, students must meet certain minimum standards. These provisions apply retroactively. The student’s academic record at Midland College is used to measure satisfactory progress and all periods of enrollment at MC must be counted, including any semesters in which the student did not receive financial aid. There are three standards for satisfactory progress: successful completion of courses, cumulative grade point average (GPA) and time frame. Successful completion of courses - Students must successfully complete at least 75% of the semester credit for which they have registered as of their enrollment on the Census date (the official count day at Midland College). This includes both developmental and college level course work. Successful completion is measured by grades of A, B, C, D, and P. Grades of F, W, AU, N, and I are counted toward the total hours attempted but not successfully completed each semester. Grade point average - Students must maintain a semester GPA of at least 2.0. Grades of A, B, C, D, P and F contribute toward this GPA. Students who have not previously attended Midland College will be assumed to be making satisfactory progress at the time of first enrollment. Remedial course work is included in the yearly GPA calculation. Time frame - Federal regulations specify that the maximum time frame for program completion may not exceed 150 percent of the published length of the program. If before completing a program, the student switches degree or certificate programs, Midland College will not count toward the 150% maximum time frame the credits attempted in the old major. However, any courses that apply to the new program must be counted. For transfer students, MC will count those transfer credits that apply toward the new or current program. Students who exceed the 150% maximum time frame limit will no longer be eligible for federal and state financial aid. Credits that have been repeated will be counted toward the 150% maximum time frame. The new grade will be used to calculate GPA. Pace – The quantitative standard which defines the student’s progression to ensure completion within the maximum time frame. Pace will be evaluated at the end of each semester, not including remedial courses. In most cases, students that have already received a type of degree, have already exceeded the maximum time frame. These students will need to contact the Financial Aid Office regarding their eligibility. Scholarship and state grant recipients must also satisfy any additional program requirements. Students that withdraw from all courses in which they are enrolled before 60 percent of the semester has passed, will immediately be placed on financial aid suspension. Students may also be responsible for paying back the unearned portion of the Title IV funds they have received. Students that receive failing grades (F), Incompletes (I), or a combination of all Fs and Is at the end of the semester will immediately be placed on financial aid suspension. Student progress is evaluated at the end of each semester, except in the case of complete withdrawals, Fs, and Is. At the time of evaluation, if a student fails to maintain satisfactory progress, the student will be placed on financial aid suspension. Students who are on financial aid suspension will no longer be eligible to receive any form of financial assistance at Midland College. After grades are posted for each term, a student’s Satisfactory Academic Progress (SAP) status will be calculated. A student who has not completed at least 75 percent of their total attempted hours at census, or is below the minimum 2.0 GPA for semester credit hours attempted, will be placed on warning. The student has one pay period to correct the deficiencies. Students on financial aid warning will continue to receive financial aid for one subsequent payment period. Aid will continue if the student is making SAP during the warning payment period. Any student who does not have a 2.0 semester GPA or has not passed at least 75 percent of cumulative credits attempted after the warning period will no longer be eligible for financial aid at Midland College until SAP is met. Students who do not meet the qualitative and/or quantitative components listed above after a warning period will be placed on suspension. Students on financial aid suspension are not eligible to receive federal financial aid for any subsequent pay periods. Students exceeding the maximum time frame allowed to obtain a degree or are mathematically unable to finish their program within the maximum time frame will be placed on immediate suspension. Please see the table below for maximum time frame criteria. Financial aid suspension, for reasons other than time, may be lifted if students receive academic advising and complete the required number of hours and achieve a 2.0 GPA. response to Financial Aid Office contacts. Written procedures are available in the Financial Aid Office. Finish What You Start at Midland College!